I was ridiculously nervous about studying abroad in Japan, and particularly about staying with a host family. I was scared that I would be lost and nervous in my surroundings. Making social and language ‘faux pas’ was a huge concern of mine. Today I am so grateful I pursued it even though I was nervous. This man right here, Hiro, my host dad has become like family to me. He’s a whirlwind of a person. A comedian, a chef, a singer, an investor and a fantastic host father. He has studied abroad in New York and California, and having received kindness from his hosts there has in turn, with his wife, decided to host students. He has been hosting for about 25 years. He’s a free spirit that lights up the room with laughter. I have become so happy, comfortable and settled here in Osaka, Japan, and I now consider it a new “home”. I have learnt so much from him in my short stay here: Japanese culture, Osaka slang (Osaka ben), economics, international politics, among a countless number of other things. He takes so much pleasure and enjoyment from everything he does and it’s simply inspiring. 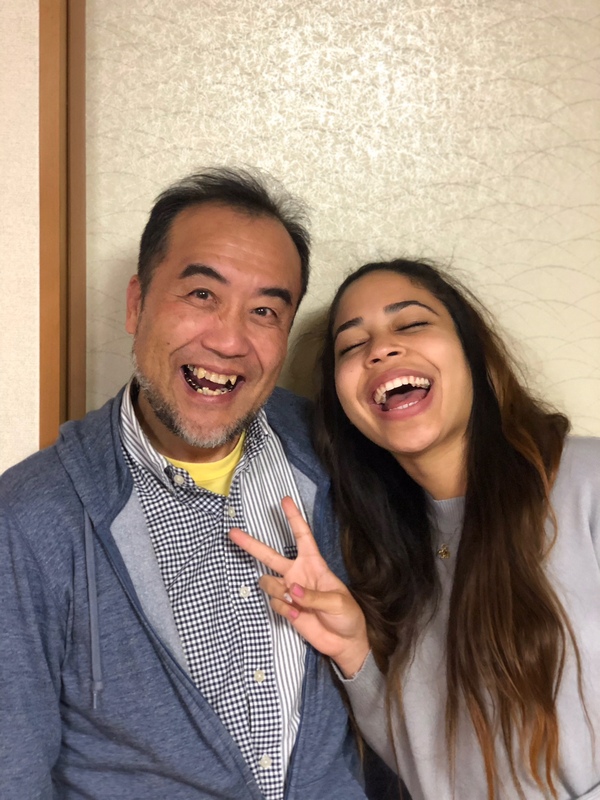 It’s so wonderful that your host Dad and Mom are so warm and welcoming, as this colors your entire perception of Japan. Kudos to Hiro , his wife and family for making the home stay experience such a great and happy one they will never be forgotten by Nicola or her family in Jamaica ! !